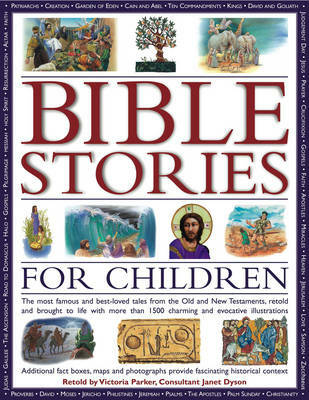 This title offers classic Old and New Testament stories retold for the younger reader, with contextual facts, notes and features. The most important stories of the Bible retold using simplified language and with clear explanations of their meanings. All the favourite stories are included, from "Adam and Eve", "Noah's Ark", and "Jonah and the Whale" to "Jesus on the Sea at Galilee", and the "Last Supper". It contains over 1500 specially commissioned diagrams, drawings and watercolour illustrations in a classic style. This special compendium brings the people, places and events of the Bible alive. Beautiful, classic illustrations capture the atmosphere and drama of the stories. Information panels provide a wealth of facts about every day life in Biblical times, and colourful maps set the stories in the context of the period. The stirring dramas of the Old Testament are recounted, from how God created the world, to the trials of the Israelites in their quest for the Promised Land. The New Testament stories follow the life of Jesus from birth to resurrection, and how the apostles spread his teachings around the world. Supplementary notes explain in simplified language what the stories mean, both within the context of the Bible itself and to life as we know it. This combination of stories and information gives a uniquely broad and accessible insight into the world of the Old and New Testaments. Charmingly illustrated with over 1500 colour pictures, this is sure to become a much-loved family reference source.